Tiger mascot Roary poses with trick or treaters at the Galion Middle School Spooktacular on Thursday evening. 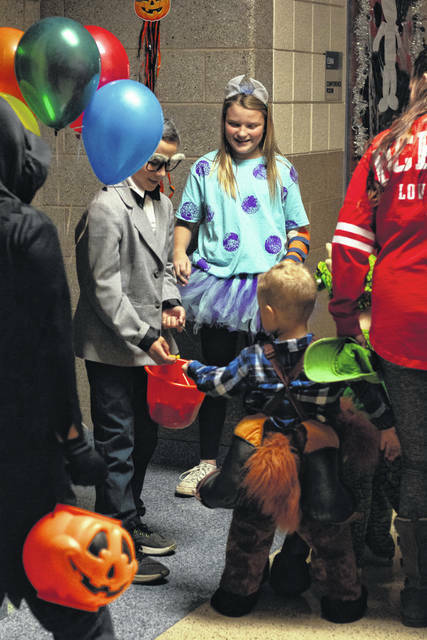 Galion Middle School sixth grade students Gradey Harding and Cameron Eckert pass out candy to trick or treaters during the school's Spooktacular event held on Thursday in the halls of the school. The event was put together by the GMS Lighthouse team. GALION — It may be Halloween, but there is a different type of spirit moving through the area as local groups keep coming up with ways to give back to the community. That giving spirit and perhaps a few other spirits was on display Thursday night at Galion Middle School as the Lighthouse Team at Galion Middle School’s decided to join in on the fun. With members of the Lighthouse Team leading the way, the middle school had its first Halloween ‘Spooktacular’ in the halls of the school. Toddlers and students up and into fifth-grade were invited to dress up and collect candy from Lighthouse team members who also were in costume. The response from the community was more than they could have anticipated. Just another example of Galion City School’s students giving back to their communities. Dozens of kids took advantage of the opportunity to do a little haunting of their own. At times, the line of kids waiting to get in on the fun past the doors open for the event. Outside, in the parking lot, were members of Galion’s fire department and police departments. They were hanging outwith some of their equipment, and met and chatted and showed off some of the tools of their trade with the trick or treaters. Just recently, the teacher positions within the Lighthouse Team were filled at Galion Middle School. According to Glew, the plan is to have students lead the teachers in what will be the future plans for the team as a whole. “I’m excited to see what direction the kids take,” stated Glew. 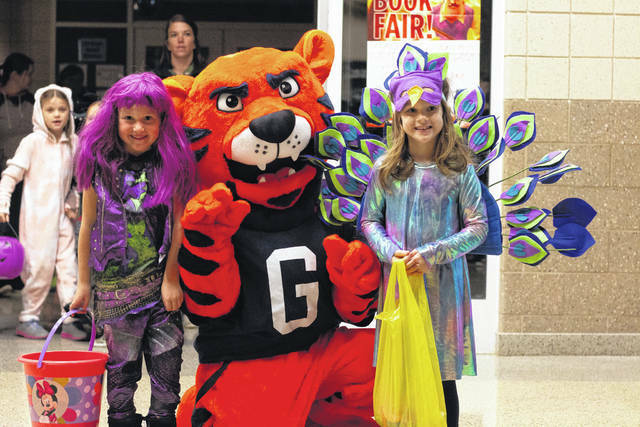 https://www.galioninquirer.com/wp-content/uploads/sites/38/2018/10/web1_IMG_0830.jpgTiger mascot Roary poses with trick or treaters at the Galion Middle School Spooktacular on Thursday evening. Galion Middle School sixth grade students Gradey Harding and Cameron Eckert pass out candy to trick or treaters during the school’s Spooktacular event held on Thursday in the halls of the school. The event was put together by the GMS Lighthouse team. https://www.galioninquirer.com/wp-content/uploads/sites/38/2018/10/web1_IMG_0824.jpgGalion Middle School sixth grade students Gradey Harding and Cameron Eckert pass out candy to trick or treaters during the school’s Spooktacular event held on Thursday in the halls of the school. The event was put together by the GMS Lighthouse team.